The ‘She is a Clubber’ aluminium can from Turkish producer Aryum received the most votes in the category for cans that are already on the market. Its intelligent concept for countering product piracy was persuasive. The owner of the ‘She’ brand, Hunca Cosmetics, is very successful with its products in Turkey and the Middle East. The brand is well known, is held in high esteem and has a high acceptance rate. No wonder, therefore, that cases of product counterfeiting have been increasingly reported in the Middle East as well as in northern Africa. That is why Aryum suggested its customer should make the can more counterfeiting-proof by using a shaping technique oriented towards the printed image. On the front of the can there is now striking and distinctive embossing in the vivid shape of a heart with the brand name ‘She’ printed in the centre. And the brand name is printed on the back of the can as well, in embossing that runs all around the can. A really successful example of anti-counterfeiting by design. The interplay of shape and print offers a fantastic new look and the colouring of the rest of the can is a real eye catcher. A great concept that combines brand presence and brand protection perfectly. 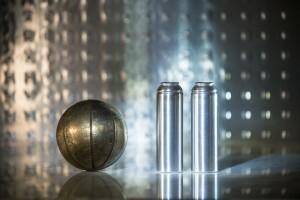 A can from German manufacturer Tubex that goes under the name ‘PURITY’ was the winner in the prototypes category. The name is the concept and the can is a true innovation. With this can, Tubex was presenting nothing less than the first aluminium aerosol can without the lacquering that such cans have always needed previously inside and outside for the shaping process, even for non-critical contents. The manufacturing process has been altered in such a way that it is now possible to completely forego this lacquering. According to the manufacturer, it was even possible at the same time to further optimise some of the can’s mechanical properties, such as a higher burst pressure. PURITY thus represents an almost revolutionary overall concept: no internal or external lacquering any more, and thus significantly improved cost economy, shorter production processes and therefore smaller investments in machinery as well, a reduced ecological footprint due to less energy consumption and lower CO2 emissions, and improved mechanical product standards.